Kaitlin has led an inspiring life thus far, and tries to continue to do so each and every day. Originally from Upstate New York, she grew up training and showing Quarter Horses. Her sense of adventure took her on an eight month road trip across country when she was 19 years of age. She camped, lived out of her car, hiked each high point in the states she went through, visited state and national parks- seeing and appreciating the country for what it is. It was early on in this trip that she went through Boone, North Carolina. Throughout her travels this small mountain town stayed with her. She returned to Boone and graduated from Appalachian State University in 2012, then pursued her love of travel as she moved to Japan after graduation. Her time in Japan was spent utilizing her knowledge of organic farming, learned from the legendary and primitive Ms. Ann Rose from Rose Mountain Farm in North Carolina. Kaitlin lived on a remote island in Japan, where mothers and children had sought out abandoned farmsteads after fleeing from the 2011 Fukushima nuclear disaster in northern Japan. She held educational organic farm workshops as well as taught English to a wide age range of Japanese natives. After this, an opportunity called Kaitlin over the border in Cambodia to work as a farm manager and yoga instructor at a meditation center. The native culture and firmly engrained spiritual belief system in Cambodia captivated Kaitlin. She developed her Yoga teaching career working in meditation centers, learning more meditation skills and techniques from Buddhist Monks. 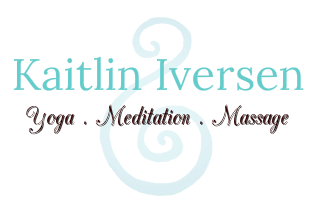 Kaitlin’s teaching style reflects the essence learned from her Buddhist teachers, of uniting the breath with the body, or meditation with asana (body positioning). She does not practice Yoga as a workout- she seeks it as a practice of nurturing the body, preparing it for meditation or deeper solitude and awareness. As she cultivated a belief system she realized how much she valued so many of the healing techniques she found to be important. So, this led her back to Thailand to study Traditional Thai Yoga Massage and Ayurvedic Bodywork from The Sunshine Network in Lahu Village, Northern Thailand. She received her International Thai Yoga Massage license, recognized by the International Society of Thai Yoga Massage. Kaitlin has since returned stateside and has over 2,800 hours of teaching experience and loves sharing the wisdom and gifts Yoga has to offer. She continues her education by diving more deeply into women’s health and getting certified in Pre and Postnatal Yoga from The Asheville Yoga Center and is a Certified Holistic Birth Doula. She is also thrilled to be bringing back more of the healing techniques she felt so strongly about while overseas by becoming certified in Cupping Therapy from the International Cupping Therapy Association (ICTA). Kaitlin has since been blessed to work with such people as Tom Myers, learning about body structure reading and Myofascial Release and she's spent time in San Francisco training with Jason Crandell, understanding different approaches to yoga instruction and anatomy. Kaitlin still seeks adventure, is always connecting with nature and looks forward to helping you live a more healthful lifestyle! !